Your values shape the path of your life. 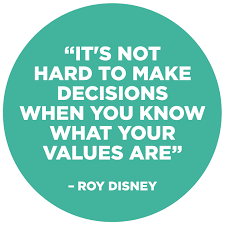 Do you know your own values? Your values are the code by which you live. They are the essential foundation for your relationships, how you work, the friends you choose – and every decision that you make, day by day. You may not consciously be aware of your values, but, whether you are or not, they are shaping the way that your life is unfolding. The values that you embrace are not just a list of things that sound nice or impressive, but actual standards that you embody in all that you do. They are the cardinal virtues that you hold dear and that you stick to, come what may. We’re living in a time when talk is cheap. All around us we see and hear many lofty-sounding statements, plenty of impressively expounded concepts, copious numbers of well-crafted speeches, lots of slickly designed mission-statements and endless great-sounding promises made in personal and professional relationships – but very few of these find their way into solid, practical action. Until these high-flown words can be measured in deeds, they remain in the realm of ideas and are nothing more than a wish-list. No matter how good they may sound, they have no effect and are worthless if nothing comes of them. For your values to be the true code of your personal standards, you have to live by them. We’re no longer satisfied by words that are nothing more than words. What is now required is that each of us, in every aspect of our lives, puts into practice the values that we espouse. Nothing short of this pristine standard will ever be acceptable if we want to feel content with what we’re making of our lives. Which values drive your life? Until you have a clear idea of your own personal values, you will not be able to hold to them. Your true values become your code of behaviour and the standards by which you live, no matter what. The ‘no matter what’ part is how you can tell if your values actually are your values. If you think of yourself as ‘Honest’ but you tell ‘white lies’ to get out of trouble, cheat on your tax return or pay a bribe, you cannot truly call yourself ‘Honest’. 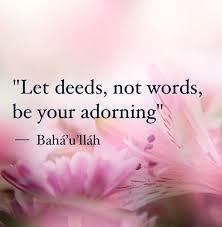 ‘ Integrity’ is only ‘Integrity’ if all your actions are ‘adorned’ with this particular value. Would other people agree that these are your values? This is the acid test. 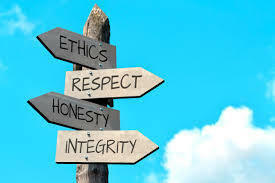 While you may consider yourself as Trustworthy, Reliable, Considerate or Respectful, if these values aren’t expressed in actions that others would be able to recognise and experience, then they aren’t genuine values. Identify the 3 main values that are so important and meaningful to you that they characterise and shape your life. For example: Are Professional, Generous, Truthful, Principled or Honourable values that are significant for you? Do you live by values such as Integrity, Perseverance, Equality or Justice? Next, give 3 examples of behaviour and actions that prove that you live by these values. And then hold yourself to them in all that you do, despite what anyone else is doing. While it’s easy to criticise what other people do – whether we know them or not – the only way we will ever see positive change in the world is for each of us to focus on cleaning up our own lives. What makes a difference is for every person to choose values that embody high and noble standards – and then to determine to live by them. In this way, our energy is not taken up by what we perceive others to be doing wrong, but rather in working to keep our own lives in line with what are truly befitting and praiseworthy qualities and values. This is how our values come to have have meaning and application in our individual capacity as well as in our contribution to humanity in general.